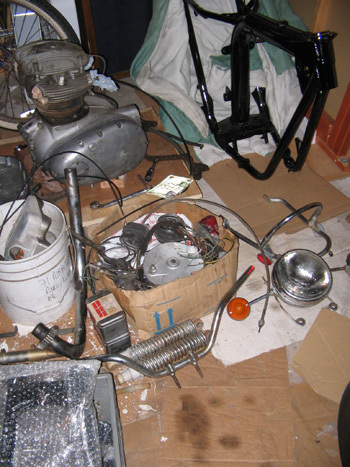 This is most of a 1971 BSA A65 Lightning 650 motorcycle. I bought it in pieces for $800. It needs a seat, mufflers (both of which I just found on eBay) and a lot of little things. It looks like the original owner crashed it, then parked it. I'm learning that it's a lot harder to put something back together if you're not the person who took it apart. I am going to buy a factory parts list so I can see what goes where, and be aware of all the little rubber gaskets that hold things together. The frame, swingarm, and other little parts (even the horn) were beautifully painted black by the guy I bought it from. He is also painting the tank for me. My first instinct was to panic after I brought it home, but I've relaxed, and I see it as a long-term project. Also I have found parts are cheap and easy to get. BSA stopped making motorcycles around 1973, so this is one of their last bikes. It has a better oil pump and primary arrangement than earlier bikes and should be pretty reliable once I get it put back together and sorted out. I'm going to wire it with a modern positive ground regulator/rectifier, and if I like the way the bike feels and I want to keep it I'll put some Mikuni carbs on it (around $300) and throw the Amals in the trash or on eBay. I had an old Triumph Bonneville chopper 15 years ago, so I have some familiarity with British bikes. 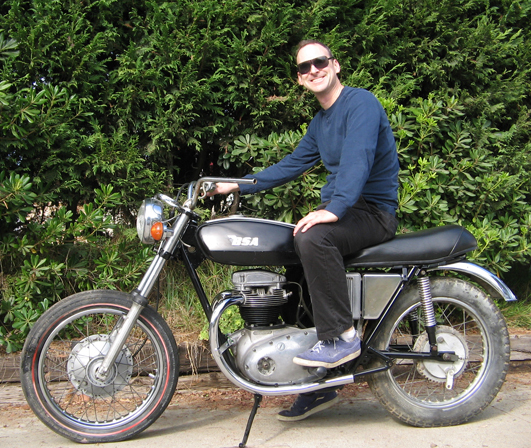 I think the main reason I bought the BSA A65 Lightning was that I don't have a bike with a kickstarter. There's something very important, very connected, in kicking the engine to life. Transferring my body's energy into the motor, getting it spinning so it can take me where I want to go. Pushing a button just doesn't feel the same to me. Here's a picture of my old blue Triumph chopper, and a picture of my grandpa on his AJS, and below that is a video of a red Triumph chopper I saw at the 2010 Long Beach Motorcycle Show. Apparently, chopped Triumphs are still cool. I pulled the cylinder head today. When I removed the valve cover I was happy that everything looked clean and healthy. I almost decided to leave it alone and just put everything back together and see if it ran. But I just got a gasket set on eBay ($28!) and thought I should take a peek at the pistons and clean any carbon off of them. So I pulled the head. 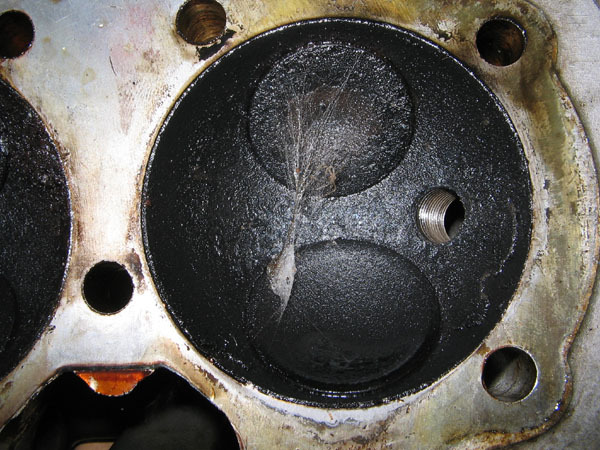 The first thing I noticed was that a spider had made a little hammock of a web between the valves (see pictures below), which indicated that one cylinder had been sitting with no spark plug for a while. Then I looked at the pistons. One was black with carbon deposits, and the other was cleaner, but scarred as if a piece of metal bounced around on it for quite a while. See pictures below. So originally I thought the bike was crashed, then parked and everything was OK. Now it looks like part of the spark plug broke off into one of the cylinders and caused the accident. I took the barrels and pistons to Wes White at Four Aces Cycles in the San Fernando Valley. 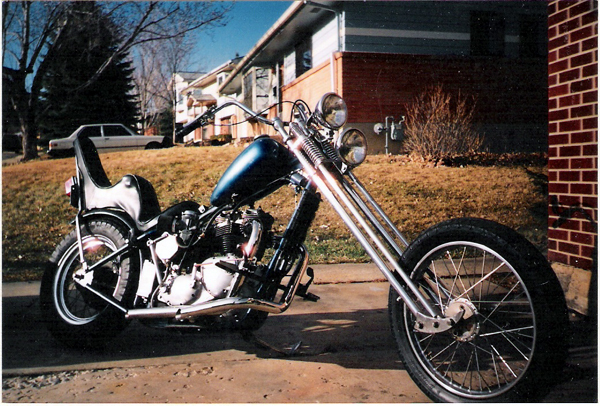 He's a really good guy, and he makes really neat custom British bobbers and Choppers. 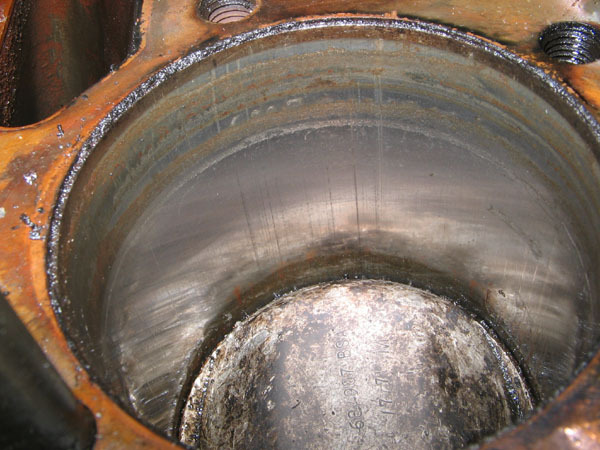 He looked at the cylinder and determined that a hone job would be sufficient, and that the pistons fit well. Including a new set of piston rings, it cost around $80 to have the barrels honed. It would have been really easy for someone to sell me a bore job and a new set of pistons in this situation, since I didn't know what I was looking at and how bad the damage was. 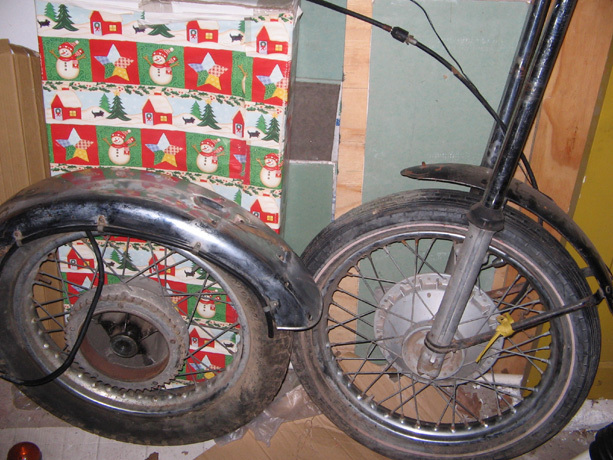 I put the wheels and forks on to see how the bike will look and fit me. It's pretty tall, as you can see from these pictures. I'm 6' 1" with a 32" inseam, and I can get my feet flat on the ground, but it's definitely a taller bike than my Suzuki GS650G. For reference, I took a picture of the frame next to my XL500R dirtbike, which is very tall. 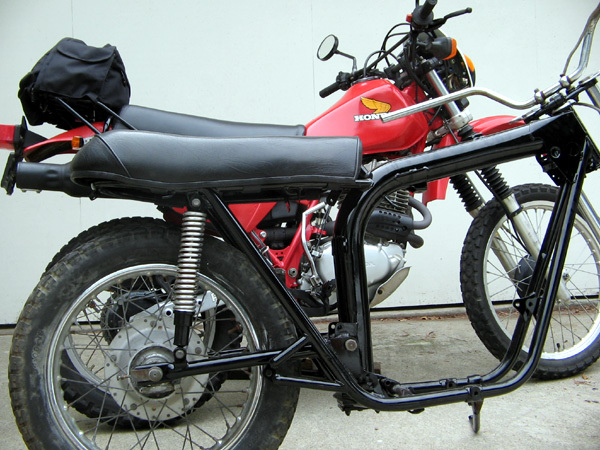 Picture was shot from seat level, so you can see the XL is just a little bit higher than the BSA A65 Lightning. The BSA should ride a little lower when the engine is in it, but I thought I should mention the height in case anyone out there is looking for an old Brit bike and is considering an oil-frame Triumph or BSA. You could put shorter shocks on the back. The way the forks are designed, you can't slide the fork legs up in the triple clamp to lower it. You could probably put shorter springs in the fork tubes to lower it. The height is perfect for me. In "Whatever Happened To The British Motorcycle Industry", Bert Hopwood says about the oil-frame bikes, "It is remarkable that with the frame change came an increase of saddle height of something like 3 inches, which had the effect of making our new models only suitable for those giants who, from astride the machine, could just reach the ground with their two feet. This, of course, created havoc with our market acceptability." I must be a giant. I like sitting up high. The engine went back together nicely, and I'll be putting it in the frame soon. The hardest part was cleaning it. The engine looked and smelled like it had been buried in a cow pasture for a decade or so. 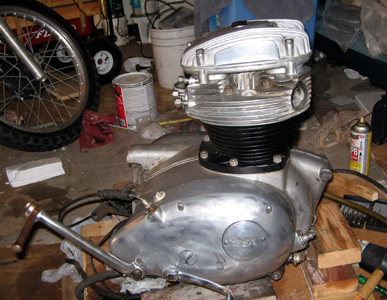 I used foaming engine brite and carburetor cleaner with heavy-duty brushes to get all the crud off. I re-painted the barrels with high-temp black semi-gloss paint. The exhaust valves were pitted, but grindable, so I ground them and put them back in. 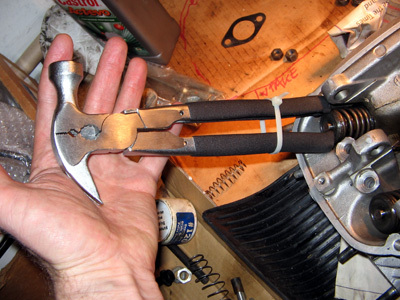 I found that my automotive-style valve spring compressor didn't work very well on the BSA Lightning heads because there wasn't enough room near the springs for it to compress them without getting caught on the metal wall of the head. To solve this, I zip-tied a pair of pliers closed and used the rubber-padded handles to press down on the spring with one hand and the head of the pliers against my chest, using my body weight to compress the spring, and my other hand installed the valve collar. It worked well and didn't do any damage to the head as my automotive spring compressor certainly would have. The pliers I used are a strange hammer/plier hybrid tool I got from my boss for Christmas one year. I think it came from the Sharper Image catalog in case you want to get yourself one. Here are some pictures. The engine is in the frame. I put it in by myself to see if I could do it, and it wasn't too hard. I padded the frame with lots of foam sheet packing material held on with scotch tape, so I didn't scratch up the new paint job. That being said, the engine is pretty heavy for one person to hold in the right position with one had while installing motor mounts with the other hand. It helps to use your knees to raise and lower the engine while aligning the bolts. Or you could invite some friends over to help. People who have done this before have told me it makes things a lot easier if you lay the engine on its side on something soft, then install the frame over it. 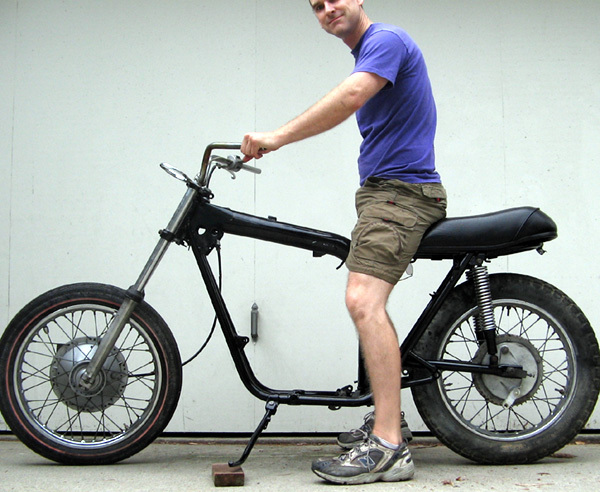 This is easier if the frame doesn't have the wheels and forks attached to it, as the frame by itself is very light. . 2009. I realized I'll never get this thing put together, so I sold it for $1,500 to some guy with a kind of hipster/Willy Wonka look, which is perfect for this bike. And I found a Royal Enfield for sale in California and bought it for $2,300. That way I have a classic bike that I can ride rather than repair. Here's the last picture of the BSA. I still would like to pick up a working 71 or 72 Lightning someday. 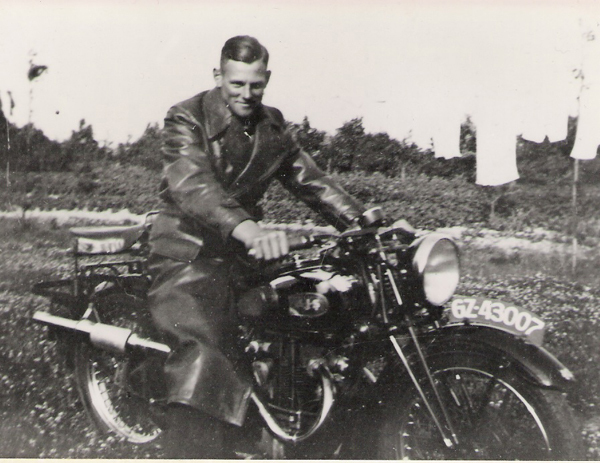 I went to a motorcycle rally in Venice in the summer of 2009 and saw a 71 BSA Thunderbolt in great stock condition. The Thunderbolt is the same as the Lightning, except that it has a single carb instead of 2. You can see it at 4 1/2 minutes into the video below. It's incredible how many classic bikes there are in the Los Angeles area. 2 guys even rode in on Vincent Shadows. I was the only guy on a Royal Enfield.